News: BenchCouncil Call for Benchmark Proposals. Bench19 Call for Papers (Denver, US, Prior to SC 2019). Data Motif published on PACT'18. Big Data and AI Proxy Benchmarks published on IISWC'18. Technical Report on BOPS: new metric for Datacenter Computing. As architecture, system, data management, and machine learning communities pay greater attention to innovative big data and AI or maching learning algorithms, architecture, and systems, the pressure of benchmarking rises. However, complexity, diversity, frequently changed workloads, and rapid evolution of big data and AI systems raise great challenges in benchmarking. First, for the sake of conciseness, benchmarking scalability, portability cost, reproducibility, and better interpretation of performance data, we need understand what are the most time-consuming classes of unit of computation among big data and AI workloads. Second, for the sake of fairness, the benchmarks must include diversity of data and workloads. Third, for co-design of software and hardware, we need simple but elegant abstractions that help achieve both efficiency and general-purpose. In addition, the benchmarks should be consistent across different communities. We specify the common requirements of Big Data and AI only algorithmically in a paper-and pencil approach, reasonably divorced from individual implementations. We capture the differences and collaborations among IoT, edge, datacenter and HPC in handling Big Data and AI workloads. We consider each big data and AI workload as a pipeline of one or more classes of units of computation performed on initial or intermediate data inputs, each of which we call a data motif . For the first time, among a wide variety of big data and AI workloads, we identify eight data motifs (PACT 18 paper)— including Matrix, Sampling, Logic, Transform, Set, Graph, Sort and Statistic computation, each of which captures the common requirements of each class of unit of computation. Other than creating a new benchmark or proxy for every possible workload, we propose using data motif-based benchmarks—the combination of eight data motifs—to represent diversity of big data and AI workloads. We release an open-source big data and AI benchmark suite—BigDataBench. The current version BigDataBench 5.0 provides 13 representative real-world data sets and 44 benchmarks. The benchmarks cover seven workload types including AI, online services, offline analytics, graph analytics, data warehouse, NoSQL, and streaming from three important application domains, Internet services (including search engines, social networks, e-commerce), recognition sciences, and medical sciences.. Our benchmark suite includes micro benchmarks, each of which is a single data motif, components benchmarks, which consist of the data motif combinations, and end-to-end application benchmarks, which are the combinations of component benchmarks. Meanwhile, data sets have great impacts on workloads behaviors and running performance (CGO’18). Hence, data varieties are considered with the whole spectrum of data types including structured, semi-structured, and unstructured data. Currently, the included data sources are text, graph, table, and image data. Using real data sets as the seed, the data generators—BDGS— generate synthetic data by scaling the seed data while keeping the data characteristics of raw data. To achieve the consistency of benchmarks across different communities, we absorb state-of-the-art algorithms from the machine learning communities that considers the model’s prediction accuracy. For the benchmarking requirements of system and data management communities, we provide diverse implementations using the state-of-the-art techniques. For offline analytics, we provide Hadoop, Spark, Flink and MPI implementations. For graph analytics, we provide Hadoop, Spark GraphX, Flink Gelly and GraphLab implementations. For AI, we provide TensorFlow and Caffe implementations. For data warehouse, we provide Hive, Spark-SQL and Impala implementations. For NoSQL, we provide MongoDB and HBase implementations. For streaming, we provide Spark streaming and JStorm implementations. For the architecture community, whatever early in the architecture design process or later in the system evaluation, it is time-consuming to run a comprehensive benchmark suite. The complex software stacks of the big data and AI workloads aggravate this issue. To tackle this challenge, we propose the data motif-based simulation benchmarks (IISWC’18 paper) for architecture communities, which speed up runtime 100 times while preserving system and micro-architectural characteristic accuracy. Also, we propose another methodology to reduce the benchmarking cost, we select a small number of representative benchmarks, called the BigDataBench subset according to workload characteristics from an architecture perspective. We provide the BigDataBench architecture subset (IISWC’14 paper) on the MARSSx86, gem5, and Simics simulator versions, respectively. Modern datacenter computer systems are widely deployed with mixed workloads to improve system utilization and save cost. However, the throughput of latency-critical workloads is dominated by their worst-case performance-tail latency. To model this important application scenario, we propose an end-to-end application benchmark---DCMix to generate mixed workloads whose latencies range from microseconds to minutes with four mixed execution modes. Modern Internet services workloads are notoriously complex in terms of industry-scale architecture fueled with machine learning algorithms. As a joint work with Alibaba, we release an end-to-end application benchmark---E-commerce Search to mimic complex modern Internet services workloads. To measure and rank high performance AI computer systems (HPC AI) or AI supercomputers, we also release an HPC AI benchmark suite (AI500), consisting of micro benchmarks, each of which is a single data motif, and component benchmarks, e.g., resnet 50. We will release an AI500 list on BenchCouncil conferences soon. Together with several industry partners, including Telecom Research Institute Technology, Huawei, Intel (China), Microsoft (China), IBM CDL, Baidu, Sina, INSPUR, ZTE and etc, we also release China’s first industry standard big data benchmark suite—-BigDataBench-DCA, which is a subset of BigDataBench 3.0. Benchmarking results are available soon. We specify the common requirements of Big Data and AI only algorithmically in a paper-and pencil approach, reasonably divorced from individual implementations. We capture the differences and collaborations among IoT, edge, datacenter and HPC in handling Big Data and AI workloads. We consider each big data and AI workload as a pipeline of one or more classes of units of computation performed on initial or intermediate data inputs, each of which we call a data motif. Other than creating a new benchmark or proxy for every possible workload, we propose using data motif-based benchmarks—the combination of eight data motifs—to represent diversity of big data and AI workloads. Figure 1 summarizes our data motif-based scalable benchmarking methodology. Figure 1 BigDataBench Benchmarking Methodology. We provide three benchmark models for evaluating hardware, software system, and algorithms, respectively. (1)The BigDataBench intact Model Division. This model is for hardware benchmarking. The users should run the implementation on their hardware directly without modification. The only allowed tuning includes hardware, OS and compiler settings. (2)The BigDataBench constrained Model Division. This model is for software system benchmarking. The division specifies the model to be used and restricts the values of hyper parameters, e.g. batch size and learning rate. The users can implement the algorithms on their software platforms or frameworks by themselves. (3)The BigDataBench free Model Division. This model is for algorithm benchmarking. The users are specified with using the same data set, with the emphasis being on advancing the state-of-the-art of algorithms. For the BigDataBench intact Model Division, the metrics include the wall clock time and energy efficiency to run benchmarks. For the BigDataBench constrained model division, the metrics include the wall clock time and energy efficiency to run benchmarks. In addition, the values of hyper parameters should be reported for audition. For the BigDataBench free model division, the metrics include the accuracy, and the wall clock time and energy efficiency to run benchmarks. BigDataBench is in fast expansion and evolution. Currently, we proposed benchmarks specifications modeling five typical application domains. The current version BigDataBench 5.0 includes real-world data sets and big data workloads, covering seven types. Table 1 summarizes the real-world data sets and scalable data generation tools included into BigDataBench ５.0, covering the whole spectrum of data types, including structured, semi-structured, and unstructured data, and different data sources, including text, graph, image, audio, video and table data. Table 2 and Table 3 present the micro benchmarks and component benchmarks in BigDataBench 5.0 from perspectives of involved data motif, application domain, workload type, data set and software stack. For some end users, they may just pay attention to big data application of a specific type. For example, they want to perform an apples-to-apples comparison of software stacks for offline analytics. They only need to choose benchmarks with the type of offline analytics.But if the users want to measure or compare big data systems and architecture, we suggest they cover all benchmarks. The component benchmarks cover a set of big data and AI problems, each defined by a dataset , an algorithm and its implementations. Dataset: Russakovsky, O.; Deng, J.; Su, H.; Krause, J.; Satheesh, S.; Ma, S.; Huang, Z.; Karpathy, A.; Khosla, A.; Bernstein, M. S.; Berg, A. C.; Fei-Fei, L. (2015). ImageNet Large Scale Visual Recognition Challenge, International Journal of Computer Vision (IJCV). Algorithm: He, K.; Zhang, X.; Ren, S; Sun, J. (2015), 'Deep Residual Learning for Image Recognition', CoRR abs/1512.03385. Dataset: Fisher Yu, Yinda Zhang, Shuran Song, Ari Seff, and Jianxiong Xiao. LSUN: Construction of a large-scale image dataset using deep learning with humans in the loop. Corr, abs/1506.03365, 2015. Algorithm: Arjovsky, Martin, Chintala, Soumith, and Bottou, L´eon. Wasserstein gan. arXiv preprint arXiv:1701.07875, 2017. Dataset: WMT English-German from Bojar, O.; Buck, C.; Federmann, C.; Haddow, B.; Koehn, P.; Monz, C.; Post, M.; Specia, L., ed. (2014), Proceedings of the Ninth Workshop on Statistical Machine Translation, Association for Computational Linguistics, Baltimore, Maryland, USA. Algorithm: Vaswani, A.; Shazeer, N.; Parmar, N.; Uszkoreit, J.; Jones, L.; Gomez, A. N.; Kaiser, L.; Polosukhin, I. (2017), 'Attention Is All You Need', CoRR abs/1706.03762. Algorithm: "Show and Tell: Lessons learned from the 2015 MSCOCO Image Captioning Challenge." Oriol Vinyals, Alexander Toshev, Samy Bengio, Dumitru Erhan. IEEE transactions on pattern analysis and machine intelligence (2016). Dataset: Panayotov, V.; Chen, G.; Povey, D.; Khudanpur, S. (2015), Librispeech: An ASR corpus based on public domain audio books, in '2015 IEEE International Conference on Acoustics, Speech and Signal Processing (ICASSP)', pp. 5206-5210. Algorithm: Amodei, D.; Anubhai, R.; Battenberg, E.; Case, C.; Casper, J.; Catanzaro, B.; Chen, J.; Chrzanowski, M.; Coates, A.; Diamos, G.; Elsen, E.; Engel, J.; Fan, L.; Fougner, C.; Han, T.; Hannun, A. Y.; Jun, B.; LeGresley, P.; Lin, L.; Narang, S.; Ng, A. Y.; Ozair, S.; Prenger, R.; Raiman, J.; Satheesh, S.; Seetapun, D.; Sengupta, S.; Wang, Y.; Wang, Z.; Wang, C.; Xiao, B.; Yogatama, D.; Zhan, J.; Zhu, Z. (2015), 'Deep Speech 2: End-to-End Speech Recognition in English and Mandarin', CoRR abs/1512.02595. Dataset: Lin, T.-Y. ; Maire, M.; Belongie, S. J.; Bourdev, L. D.; Girshick, R. B.; Hays, J.; Perona, P.; Ramanan, D.; Dollбr, P.; Zitnick, C. L. (2014), 'Microsoft COCO: Common Objects in Context', CoRR abs/1405.0312. Dataset: Harper, F. M.; Konstan, J. A. (2015), 'The MovieLens Datasets: History and Context', ACM Trans. Interact. Intell. Syst. 5(4), 19:1--19:19. Algorithm: D. M. Blei, A. Y. Ng, and M. I. Jordan. Latent dirichlet allocation. the Journal of machine Learning research, 3:993–1022, 2003. Algorithm: Krishna, K., Murty, M. N. (1999). Genetic K-means algorithm. IEEE Transactions on Systems, Man, and Cybernetics, Part B (Cybernetics), 29(3), 433-439. Algorithm: Rish, I. (2001, August). An empirical study of the naive Bayes classifier. In IJCAI 2001 workshop on empirical methods in artificial intelligence (Vol. 3, No. 22, pp. 41-46). New York: IBM. Algorithm: Lowe, D. G. (2004). Distinctive image features from scale-invariant keypoints. International journal of computer vision, 60(2), 91-110. Algorithm: Black, Paul E., inverted index, Dictionary of Algorithms and Data Structures, U.S. National Institute of Standards and Technology Oct 2006. Verified Dec 2006. Since deep learning has made unprecedented success in a wide spectrum of commercial AI areas such as image recognition, natural language processing and auto driving, the HPC community started using deep learning to solve scientific problems (e.g. extreme weather prediction). These emerging AI workloads with new performance characteristics require a new yard stick to design next generation HPC system. In this context, we present AI500 benchmark, a benchmark suite for evaluating HPC AI systems.AI500 benchmark consist of several micro benchmarks and component benchmarks. 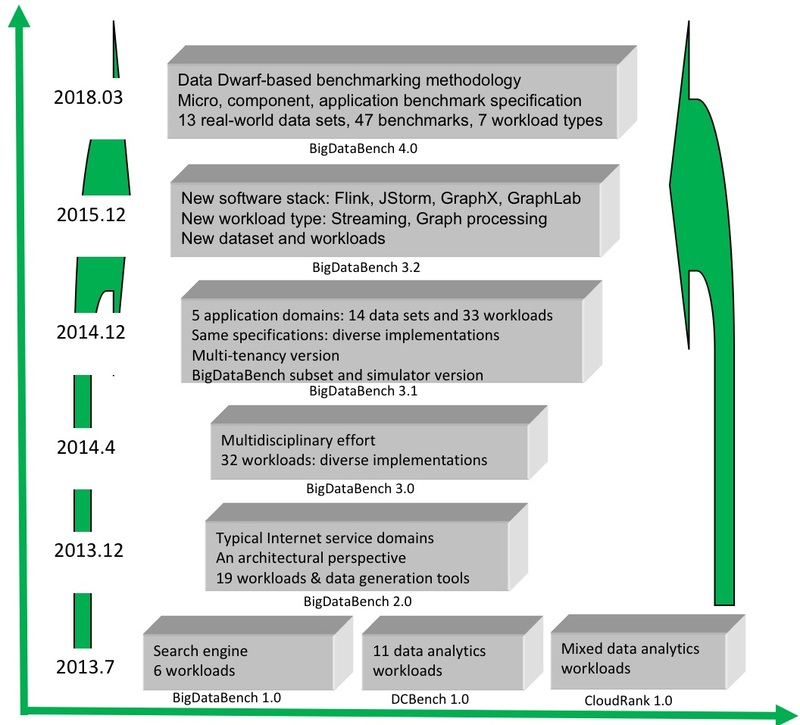 As shown in Figure 2, the evolution of BigDataBench has gone through three major stages: At the first stage, we released three benchmarks suites, BigDataBench 1.0 (6 workloads from Search engine), DCBench 1.0 (11 workloads from data analytics), and CloudRank 1.0(mixed data analytics workloads). At the second stage, we merged the previous three benchmark suites and release BigDataBench 2.0 , through investigating the top three important application domains from internet services in terms of the number of page views and daily visitors. BigDataBench 2.0 includes 6 real-world data sets, and 19 big data workloads with different implementations, covering six application scenarios: micro benchmarks, Cloud OLTP, relational query, search engine, social networks, and e-commerce. Moreover, BigDataBench 2.0 provides several big data generation tools–BDGS– to generate scalable big data, e.g, PB scale, from small-scale real-world data while preserving their original characteristics. BigDataBench 3.0 is a multidisciplinary effort. It includes 6 real-world, 2 synthetic data sets, and 32 big data workloads, covering micro and application benchmarks from typical application domains, e. g., search engine, social networks, and e-commerce. As to generating representative and variety of big data workloads, BigDataBench 3.0 focuses on units of computation that frequently appear in Cloud OLTP, OLAP, interactive and offline analytics. More questions & answers are available from the handbook of BigDataBench.